Health Facility Networked IT and Audio Visual Solutions from the AV Design Group. Delivering innovative and dynamic ICT solutions for the Healthcare sector. The healthcare sector is under constant pressure to improve the quality and efficiency of patient care whilst making cost savings. Improving the management of patient information and streamlining processes are fundamental to achieving these goals. The UK Healthcare industry is changing and with change comes opportunity. Efficiency targets, driven by the Gershon review and the more recent Operational Efficiency Programme have increased the pressure for Healthcare organisations to improve their processes and cut costs – transforming the ICT infrastructure is increasingly becoming a key enabler in the drive to redesign and improve services in the NHS. LAN/WAN infrastructure – including Wireless LANs, to facilitate care at the bedside. IP telephony, unified communications and video conferencing – to improve inter-hospital communication and enable more effective collaboration to speed up both diagnosis and treatment. Asset Tagging – RFID tagging to help locate both equipment and patients – saving significant, time and money. 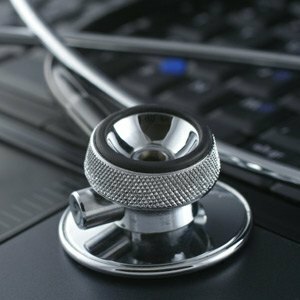 The role of technology can also have a positive impact on carbon reduction to help healthcare trusts to meet efficiency targets. Why Audiovisual Design Group IT Enterprise Services? High definition video solutions can provide a real-time high-quality experience – either to provide remote access to primary care, or potential outbound specialist services from a hospital. This can save on travel, time and costs. By adopting a homeworking policy, non-critical staff can work remotely to reduce staff travel. Our tailored solutions offer a homeworking environment with the look and feel of a normal office environment, including video and collaboration tools. Collaboration technologies allow documents, presentations, images and case notes to be shared across the network, supporting virtual conferences and other meetings without the need for travel. Virtualisation technology can help to maximise the use of ICT while minimising power and cooling requirements, reducing the overall energy footprint. For more information or to schedule an expert consultation you can contact the AV Design Group by email or filling out our form below.